Uninterrupted views across the Lagoon to the famous Knysna Heads, Azure House offers the prefect base from which to explore the Garden Route. Enjoy a sundowner on your private patio and watch the yachts and fishing boats returning home after a day on the Indian Ocean. Stannards Guest Lodge is a 4-star guesthouse situated in a tree-lined suburb of Knysna on South Africa's scenic Garden Route. This uniquely designed house, with exceptional sea view offers two separate fully furnished apartments. Each apartment has a separate entrance and shaded car park, DSTV and Wi-Fi on demand in both apartments. Sunset View1 sleeps 6 and Sunset View2 sleeps 4. Narnia Country Guest House, with its majestic hilltop views of the Knysna Heads, lagoon, river and Outenqiua Mountains is just 2.5 km from the town of Knysna. Offering upmarket Bed and Breakfast and self catering accommodation in Knysna at affordable prices, guests are able to stay in 4 star graded rooms. The stone and timber house nestles in an acre of award winning gardens on a 100 acre secure access estate with buck, lynx, porcupine and profilific birdlife. Dramatic sea, lagoon and cliff views from every window. Uniquely situated on the highest point of the famous Knysna Heads, Headlands House offers breathtaking views. Headlands House is managed with uncompromising quality of service and attention to detail. Ocean View Lodge is a small country hotel owned by the same family since 1989. It is situated on 21 acres of "dreamland" on a unique narrow peninsula and surrounded by the azure waters of the Knysna Lagoon and the gentle Indian Ocean. A Jewel in the heart of the Garden Route, this is where you find affordable luxury, superb service, lovely garden with sparkling pool, secure parking and the very best hospitality. Walk to lagoon and golf course. AA Award winning Best Large Country-style Retreat 2000, 2001 & 2002. 4* Belvidere Manor Hotel offers luxurious cottage accommodation with stunning views across Knysna's lagoon. Enjoy superb cuisine and fine wines in a tranquil relaxing atmosphere. Packwood is located in 1000 acres of stunning countryside, at the doorstep of the Garden of Eden nature is in abundance. Equidistant between Knysna and Plettenberg Bay. Packwood’s thatched farmhouse, plentiful space and very comfortable living accommodation. Sip and savour this unique destination whilst enjoying our beautiful wines and bubbly and homemade cheese platters all made using produce from the vineyard and farm. 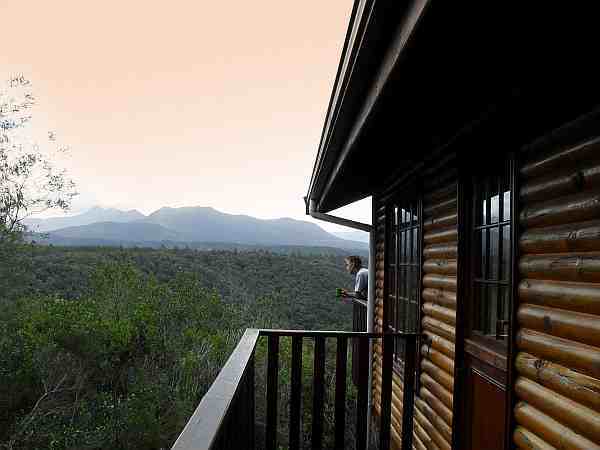 A working organic farm with it's own 60 Ha indigenous forest reserve offers you peace , tranquility and unrivaled privacy, combined with unbeatable views of the Garden Route's Outeniqua mountains. from your secluded accommodation explore the forest, enjoy a swim and sauna or watch the setting sun from your veranda. Tel: +27 (0) 44 389 0029 • Fax: +27 (0) 44 389 0029. Situated on Leisure Isle, the island of tranquility, this gracious guesthouse is nestled in a quiet circle just a minutes walk from the Knysna lagoon and offers contemporary accommodation with all the latest amenities you would expect of a 5 star guesthouse. A Luxury Guest House situated on top of the Welbedacht Cliffs 3km from Knysna. The 5 suites have magical views from every corner of the room with jacuzzi bath, twin showers, air-con, underfloor heating, tea and coffee and honesty bar. Knysna Manor is a three star Victorian styled guesthouse nestled in the heart of Knysna. From the original Yellow Wood floors, to the character of each individual room, the Victorian theme is carried throughout our charming B&B. Widely regarded as the best place to enjoy Knysna is on beautiful Leisure Island and the 4-Star Knysna Belle occupies one of the island�s very best positions, just off bollard beach. Exclusive accommodation in the heart of the world famous Garden Route. Olde Worlde Victorian styled, the Lodge epitomizes gracious living. It caters for the most discerning guest who enjoys the finer things in life.